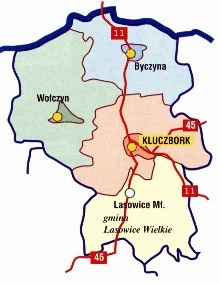 Administratively, the Kluczbork County is divided into four communes, namely Kluczbork, Wołczyn, Byczyna and Lasowice Wielkie - the first three include urban and rural communes, the fourth one is the rural commune. The County encompasses an area of 852 square kilometers and presently has a population of around 69 700 people. The domestic roads, such as No 11 Gliwice - to - Poznań and Opole - to - Łódź are intersecting on its territory, what in turn is favorable for passenger traffic and at the same time transport traffic both within the country as well as abroad (Germany and the Czech Republic). The Town of Kluczbork is also a significant railway junction with Katowice - to - Wrocław and Katowice - to -Poznań lines as well as towards Częstochowa and Opole. The Kluczbork County is situated in the „Śląska Lowlands by the River Stobrawa - the right tributary of the River Odra in the northern part of the Opole Province covering the south-western part of the country of the ancient Piasts' (Polish dynasty of kings) Silesia Land. Due to its situation as far as land configuration is concerned, the Kluczbork County belongs to the lowland areas. Considerable part of its area does not exceed the level of 250 m a.s.l. Thus, lowland areas are dominating in the landscape and unevenness of the land - usually de-level-ling does not exceed beyond 20 up to 40 m.
The area of the Kluczbork County belongs to the warmest region of the Nadodrzański Region. The annual air temperature in a year is +8.2 o C. In comparison to the other regions of Poland, this is a high value. The highest temperature occurs in the summer months: June, July, August with the maximum temperature in July. The lo-west temperature has been recorded in January. The period of thermal summer lasts over 90 days, spring and autumn from 65 up to 70 days, winter from around 23 up to 30 days. On average, the total precipitation is running at the level from 600 up to 650 mm in a year and from 375 up to 430 mm in the period of increased demand of plants for water, what on a countrywide scale makes up temperate values. The most precipitation, according to the carried out tests, occurs in July, on average 95 mm in a month. Yet, the lowest precipitation is recorded in the winter months, February and March - respectively 32 mm and 34 mm. Over a year, on average there are 156 days with the precipitation above 0.1 mm. The average relative humidity in a year in the Kluczbork County is around 80 percent. This is a temperate value with the tendency to high. In the average annual course, the maximum humidity is recorded in the autumn and winter months: November and December around 87% and 88%, yet the lowest humidity is recorded in April around 74 percent, May about 75 percent and June 74 percent. Western winds dominate with a considerable share of south-western winds occurring in autumn and winter as well as north-western in spring and summer. The winds are characterized by minor speed. The number of days with strong winds is around 20. The Kluczbork County due to its location, natural resources, tradition and history features an agricultural and industrial character. The mosaic of forests and meadows as well as numerously occurring rivers and ponds make the area of the county various in habitats and plant gatherings abundant in protected and rare species of plants. Many of them, such as Lycopodium claratum (Latin), wild pepper, periwinkle Nymphaea alba (latin and have been numbered among the "Red list of vascular plants endangered in Poland". Numerous forests complexes are very attractive for mushroom pickers, as there is a great abundance of mushrooms here (boletus, chanterelle, Suillus (Latin), podgrzybek) as well as undergrowth (bilberries), and at the same time forests full of game, such as deers, wild boars, hares, foxes and martens. What makes up a great attractiveness for hunters. The area of the county, apart from the variety of the plant and animal world and abundance of forests are characterized by natural resources, such as Wołczyńska brine of the temperature of +43.3oC (chlorine, sodium, lime, bromine, ferruginous and boron brine) having the certificate of the Minister of Environmental Protection qualified for usage in balneology), gravel used in construction, sand, peat, pure air, good water and many green areas. The borders of the Kluczbork County cover the part of the Strobrawski Landscape Park as well as the area of the protected landscape "Strobrawsko-Turawskie Forests".